Les Causeurs(photo credit: portalix – Wikimedia). Latitude: 48.038149. Longitude: 4.851246. On a grassy mound at the south-west side of St Guénolé’s church on the I’le de Sein (Sein Island) – five miles off the Finistere coast at Pointe du Raz (Bretagne), Brittany, are two tall granite standing stones (menhirs) that are said to date from the Neolithic. These two standing stones may originally have been part of a stone circle. 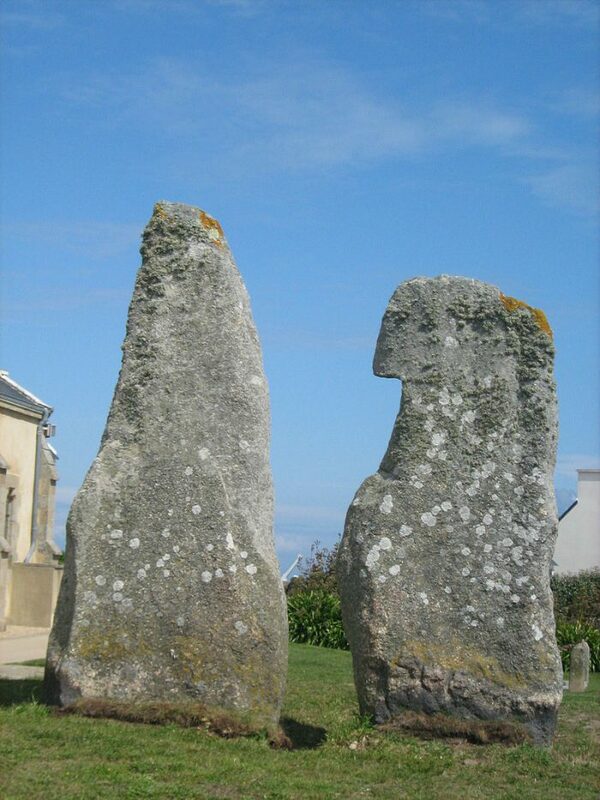 There are a number of myths and legends associated with these menhirs, and also the surrounding area in which they stand. The island, known as Enez Sun in Breton, is also steeped in pre-Christian myths and legends associated with druidic ritual. The standing stones can be seen on a low, grassy mound at the south-western side of St Guénolé’s Church (Eglise Saint-Guénolé) on the Place Francois-Le-Sud – just to the west of Port du Men-Briel. Insight Guide, Brittany, (First Edition), APA Publications (HK) Ltd., 1994. Queffelec, Henri, Un Recteur De L’ile De Sein, George G. Harrap & Co. Ltd., London, 1972.
https://fr.wikipedia.org/wiki/Les_Causeurs (Photo displayed under the Licence Creative Commons 3.0). Categories: Myths And Legends, Standing Stones | Tags: Les Causeurs Menhirs on I'le de Sein in Finistere (Bretagne) Brittany | Permalink.